Luxury Real Estate Marketing: Luxury on a Dime! In our home town of Santa Barbara, California we are extremely fortunate to be able to shop year-round at outdoor farmers’ markets five days a week (except for relatively few rainy days). It is one of the many amenities that contribute to the quality of life here. To participate, all of the farmers’ produce must be certified organic. In our local supermarkets and specialty markets like our favorite, Trader Joe’s, you usually have a choice between organic and non organic produce. Organic is usually more expensive. Given the price differential, you could say that organic produce is a luxury. In fact, understanding the buying decision between these two options in produce can shed some light on the very meaning of luxury, itself. Here is how the USDA (Department of Agriculture) defines ‘organic’. Many studies have demonstrated that organic is simply better for your health. This could be a justification to spend more on organic produce. Many say that the peace of mind alone is worth it, even if they are not certain that organic produce is actually healthier. The price of illness far outweighs the price differential between the two choices. Bananas are rarely grown by local farmers. Most bananas are grown in Central American and South America. 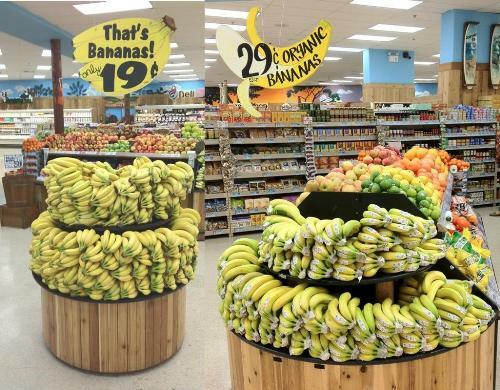 Therefore, for us, Trader Joe’s is where we purchase bananas. We like to buy them partially green so that they do not get over-ripe before we are ready to eat them. But, up until recently, we purchased, non-organic bananas without thinking much about the difference. That is because bananas supposedly are resistant to pesticides due to their thick skin. Recently, we could not find partially green bananas in the non-organic stand, so we bought organic as a matter of convenience. Then, we had a big surprise! The organic bananas taste remarkably better. The flavor was more pronounced and so was the aroma. Now, we only buy organic bananas. For 10 cents extra, the taste is worth it and in the long run, organic bananas are probably healthier. What was interesting here is the decision making process that shed some light on the price differential that made organic banana a luxury. Health, peace of mind, convenience and finally taste, these are some of the “quality cues” and the values that comprise the luxury mindset and justify a higher price point. Now, that is luxury on a dime!